Tis the season for spooky fun! 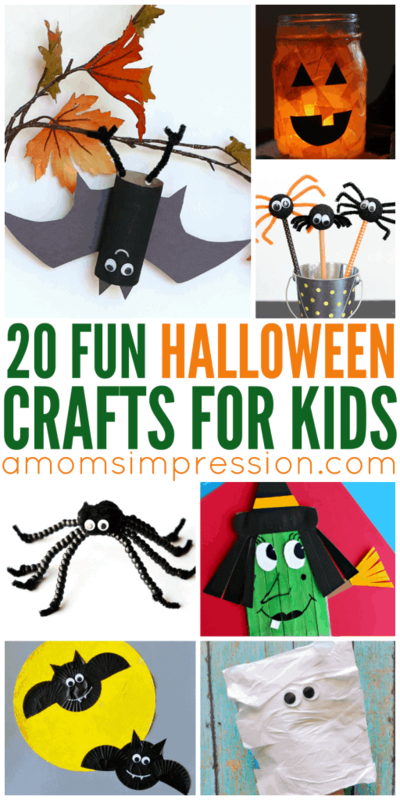 Check out these 20 easy and fun Halloween Crafts for Kids. These Halloween Ideas are inexpensive and will be sure to give your family fun chills and thrills this season! LOOKING FOR MORE HALLOWEEN FUN? PLEASE ALSO CHECK OUT MY HALLOWEEN LUNCH AND FREE PRINTABLES AND MY CRESCENT MUMMY HOT DOGS RECIPE! I am so excited for Halloween. The kids are going back and forth on what they want to dress up as, right now its between a donut and a unicorn for Caroline and a pirate and a TMNT for Jonah. This year is going to be extra special as it will be the first time in over 7 years where my husband doesn’t have to work! Yay! I am excited to host our niece and nephew and have a little party for the adults as well. As I was planing our little party, I was thinking about some Halloween decoration ideas for the house and how I can get the kids involved. Alas, I searched the Internet for some easy Halloween crafts for kids for us to make and decorated the house with. I have also created a super cute “take one” candy sign to display on our front door while we are out gathering candy! If you are looking for some fun bat crafts, this one is for you! I hope you can use some of these Halloween Craft Ideas. What are some of your favorite things to do on Halloween? Do you have a special Halloween Crafts for kids that you would like to share?